Club Penguin Cheats by Mimo777 Club Penguin Cheats by Mimo777: New Elite Penguin Force Downloadable Mission is here! New Elite Penguin Force Downloadable Mission is here! It's finally here! 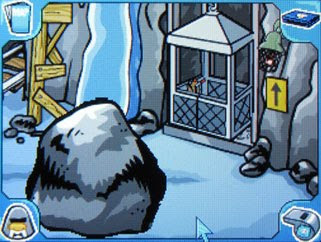 The very first downloadable Elite Penguin Force Mission on the Nintendo DS! It's called Puffle Prankster! The mission is really not that fun. It is very repetitive and kinda lame. But it is something new so give it a shot if you have Eilite Penguin Force! If you do the mission, it kinda makes it sound like they are making a Puffle Training Center in the basement of the Dojo. That's my theory! What do you think? Click here to get the whole cheat walk-through at my Club Penguin DS Elite Penguin Force site! I ALREADY BEAT IT ITS WAY EASY! It wont work i go to upload download and then click on Access previosly download content and nothing happens.Am i doing the right thing mimo? That is really cool mimo im going to get the game for christmas! cool/not cool. Ill try it! OMG it is finally here and i don't have Wi-FI. omg that would be so FLIPPIN cool! id probably try to train my black puffle to be nicer and more friendly! I think that they have a construction at the EPF room. Because when you visti that room in this mission you can see that. And not when you are playing the storyline. So i think that is the big clue. Are you serious? This is really fun! It has the white puffle! I'm not a member, so any chance to use every puffle is a good one! do you think i could fix it? Maybe our puffles is going t learn card-jits, but instead of earning belts. They earn cakes, in different colors! i keep checking all day for the mission on my ds and nothing is happening?? how come?? ummm anyone know how to download stuff? i have the first type o nintendo (regular) and i think i need a usb cable or somethin like that...HELP!!! Goodthinking! Yeah, it was a waste, since we waited all that time! P.S. Its me, Doreysweetie626 from Chobots! its soo boring!!! all u do is clean puffles and waste ur time... big woop!! I really need someone to explain this to me. How do i download the mission onto my DS ? It is pretty lame. All you do is search for puffles. do you think i can fix it? u dont need the mic for the new mission so its okay. How do you get it? I want to have a go to get my 100% thing on it. Yeah!!! What are you talking about? I love this mission. its fun. if you think otherwise then maybe your too old. mimo it goes along with the game if you have played it all. The games all include the puffles. I can not get it downloaded do you have to have wi-fi ??????????? ?